It has been lovingly restored from an Eighteenth Century Cow Mistle and Granary to form a traditional Dales Home enhanced by many original features whilst complimented by modern facilities. Covill Barn, as well as being John and Sue's home, provides quality accommodation for walkers cyclists and motorists who wish to explore this beautiful area. SELF CATERING GRANARY COTTAGE The granary attached to the Barn has been converted to form a traditional self contained cottage, sleeping two with enviable views over Nidderdale and Gouthwaite Nature Reserve, available all year on a weekly basis and for short winter breaks at competitive prices. If four people wish to self cater then our twin bedded B&B room with en suite can provide private additional sleeping while the Granarys kitchen and living area are shared. BED & BREAKFAST Traditionally furnished double and twin rooms within the main house with breathtaking views to the head of the Dale and over Gouthwaite Nature Reserve, full en-suite facilities, colour TV and Tea and Coffee making facilities. Stream side patio for guests. Designated an Area of Outstanding Natural Beauty. Nidderdale - the valley or dale of the river Nidd, is 20 miles long from Ripley Castle to the river's source on the slopes of Great Whernside, very unspoilt and is smaller than neighboring Wensleydale and Wharfedale. Covill Barn overlooks a Nature Reserve at Ramsgill near Pateley Bridge. An ideal base for walking, birdwatching and sight seeing. Good walking starts directly from Covill Barn including the Nidderdale Way and a numerous variety of uncrowded footpaths and bridle paths across Nidderdale from the valley to the moors.  Packed lunches are available if booked the day before. Mountain biking is extremely popular with bridle paths linking up to other dales crossing the moors.  Safe cycle storage is available free of charge. Gouthwaite Nature Reserve can be viewed from your accommodation or you can walk around its boundary or use one of the hides provided. There is also a good variety of birds of prey to be seen soaring over the dale. Sarah Garforth owns and runs The Ramsgill Studio just 1 mile from Covill Barn. She runs a number of workshops throughout the year covering oils, water colours, acrylics, pastels, drawing and sketching both outdoors and indoors in her purpose built studio. A two course lunch is normally included and materials can be supplied. Visit for more details. The ultimate adventure - Via Ferrata / gorge / abseil. The 'Iron Way' is a network of metal beams, ladders and cables set in the rocks. Visit for more details. If you are looking for a fun, relaxing, high quality experience try Llama Trekking in the UK. As Yorkshire is the perfect place, why not join them on one of their experiences or treks with their wonderful team. for more details. Harrogate is 20 miles away with its colourful floral gardens. It is 15 miles to the cathedral city of Ripon and 30 miles to York with its wealth of attractions. 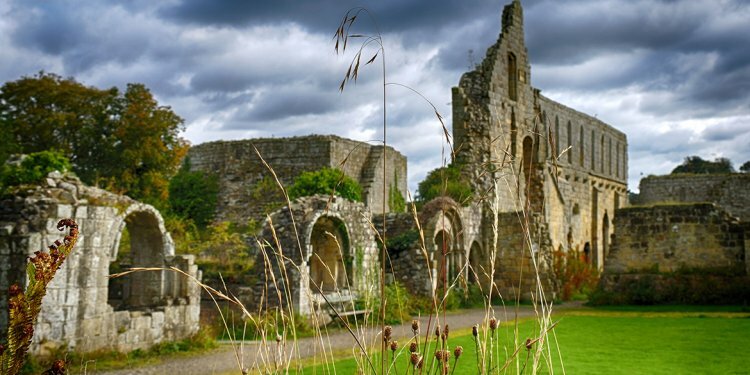 Locally, you can visit the World Heritage site of Fountains Abbey, Newby Hall, Skipton, Grassington, Stumps Cross Caverns, Brimham Rocks and How Stean Gorge. There are highest quality local restaurants and traditional pubs within a short drive. From £40 per person per night based on two sharing. Single occupancy £55. From £260 to £400 per week based on two occupants. We can accommodate 4 people self catering when our Twin en-suite room is available. See our Tariff page for prices.